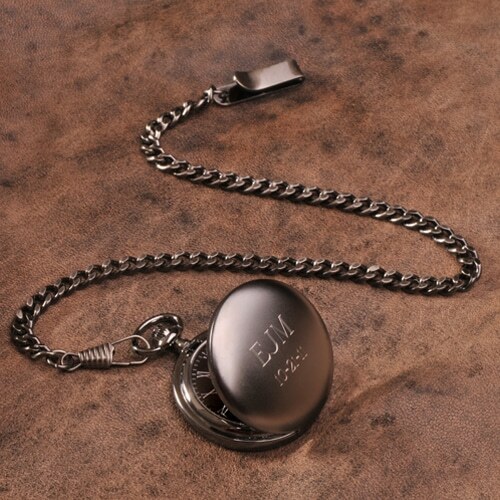 Engrave this dashing gunmetal pocket watch with a personal message for no extra cost. 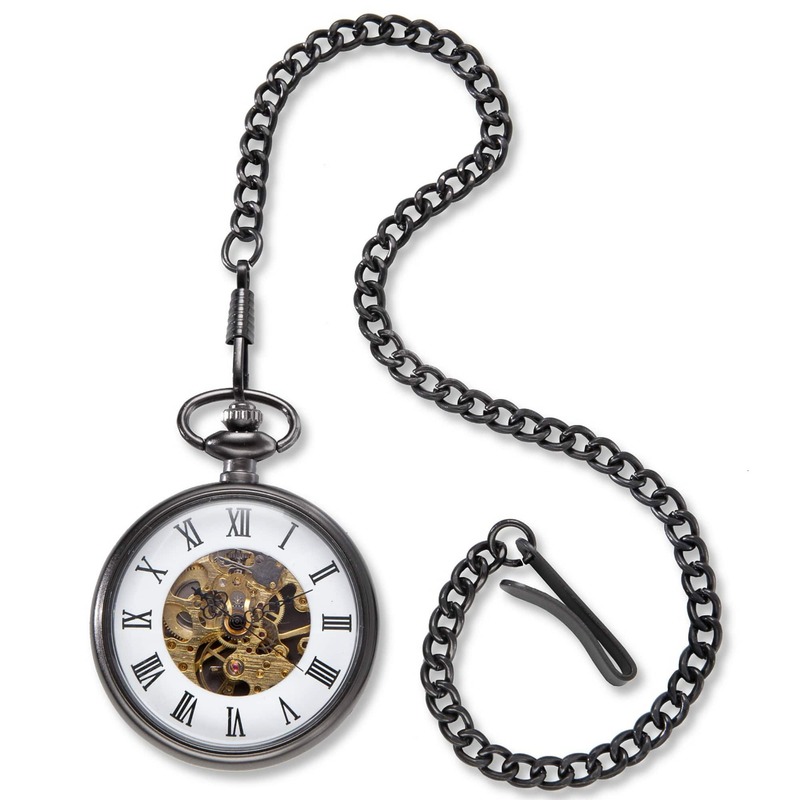 Our Personalized Gunmetal Pocket Watch features a handsome black face with Roman numerals and includes a gunmetal gray finish. 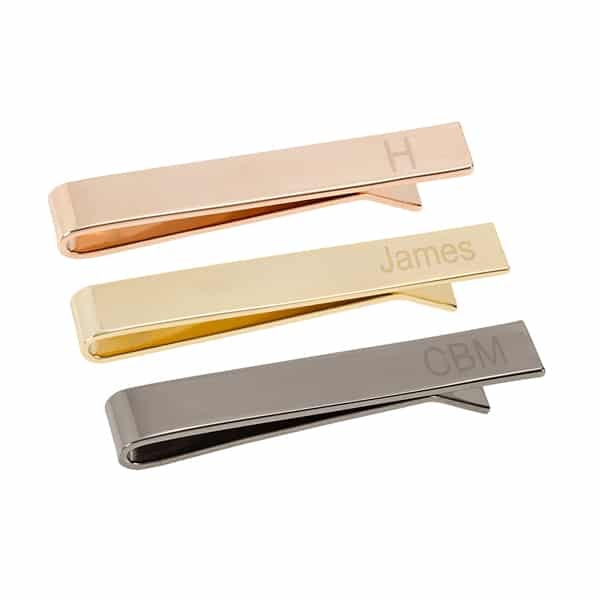 The classic and contemporary look will be a dashing complement to any groom or groomsmen’s attire – while the sturdy chain and clip make for easy safe keeping. Giving as a gift for a special occasion? 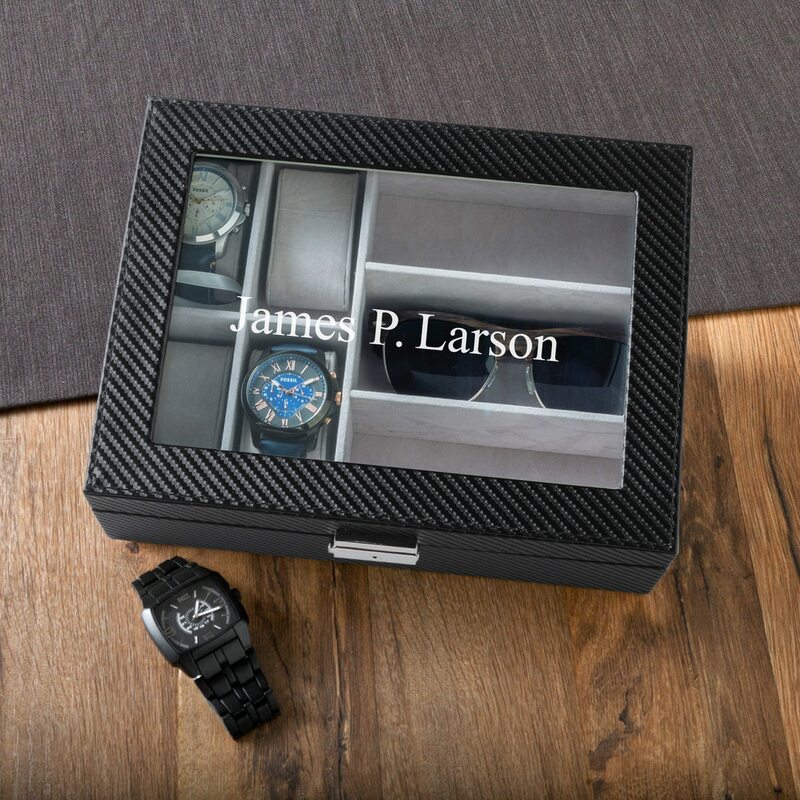 We’ll include a wood gift box and engrave up to three lines of text for free. Consider this beautiful pocket watch for Father’s Day, graduation or a retirement party. 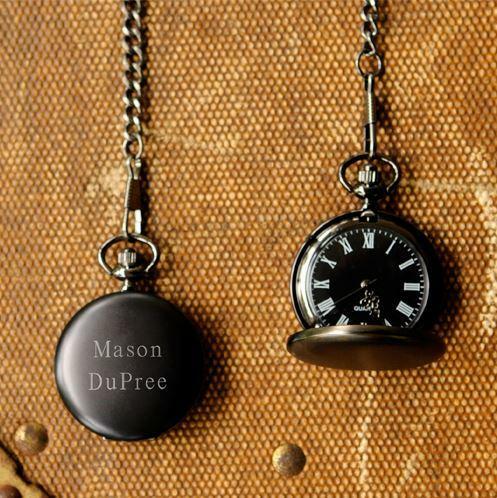 If you’re presenting to your best man, it’ll look great personalized with his name and the date of your wedding. Measures 1 1/2" in diameter. Includes a 14" sturdy removable chain. If I only enter one line of text, will the engraving be centered on the watch? 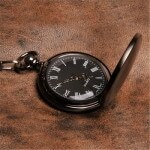 I recently purchased 12 of these pocket watches. I filled out the lines for engravings for with the initials of my groomsmen. I wasn't paying attention and I put multiple initials on watches and left initials off some altogether. One of the people from the company saw this and emailed me just to make sure it was what I wanted. I told him it was wrong and they changed it at no extra charge. They just came today and they look great. Feels high quality. Everyone who has seen it thinks it's awesome. Highly recommend. 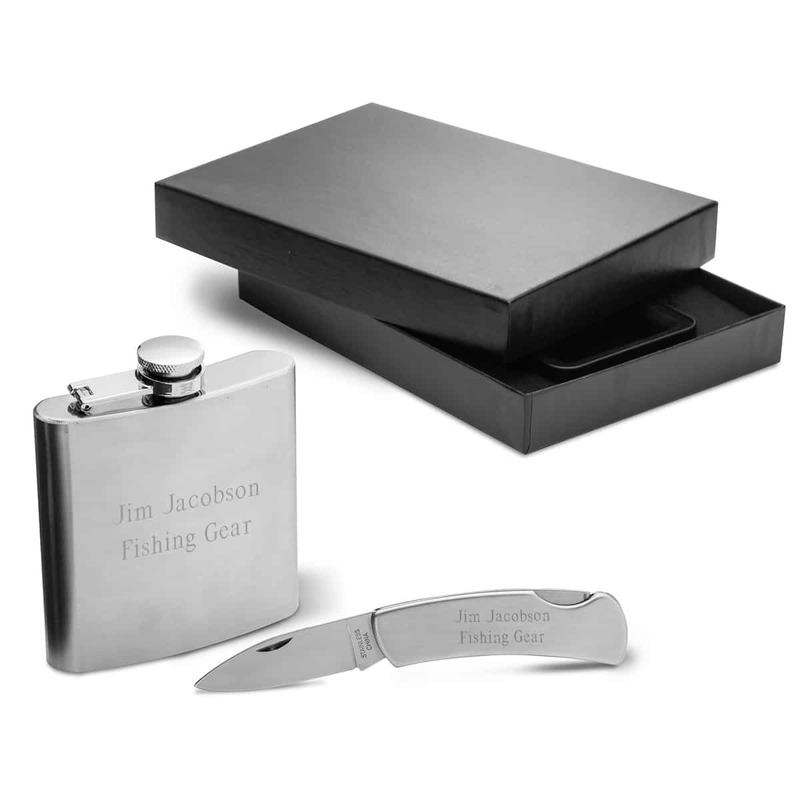 I hope I don't need groomsmen gifts again but if I do I know what I'm getting. I was absolutely thrilled with this watch. It exceeded my expectations and I was pleased with the sevice and product. The little pine box was a nice surprise that made it a grand slam! We had a groomsman drop out 4 days before the wedding due to a family emergency. 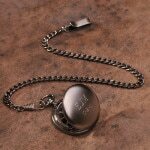 We had purchased monogrammed pocket watches from The Man Registry for all of the guys, but we of course didn't have one for our last minute replacement. We called in and explained the situation and they were able to work with us to make sure we got another watch in time to hand them all out together at the rehearsal dinner on Friday night. A+ experience overall!! !